The Breitling Navitimer 8 is a new interpretation of an iconic pilot's watch. Lacking a slide rule bezel, this line is focused on what's essential: tracking the time. Top models feature in-house calibers with chronograph or world time functions. In early 2018, the Swiss luxury watch manufacturer Breitling announced the Navitimer 8 collection with six models. 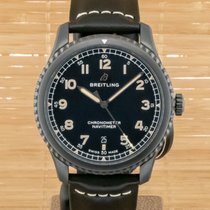 It was the first line of watches to be introduced under the leadership of Georges Kern, who has been Breitling's CEO since July 2017. Before that, he had already made a name for himself in the watch industry as the CEO of IWC, and later as Head of Watchmaking, Marketing, and Digital for the entire Richemont group. The automatic in-house B01 caliber with a chronograph function ticks away inside the top Navitimer 8 models. Frequent travelers will enjoy the Unitimer variants with world time functions. The Navitimer 8 Chronograph represents a more affordable alternative to the watches with in-house movements. It is powered by the Valjoux 7750. Entry level models in this collection include the Navitimer 8 Automatic 41 with a date display and the Navitimer 8 Day & Date with day and date displays. Both models use calibers based on ETA movements. The '8' in the Navitimer 8's name comes from the Huit Aviation department founded by Willy Breitling in the late 1930s. The French word "huit" means "eight" in English and refers to the eight-day power reserve of the onboard clocks produced by the department. Navitimer 8 models with an in-house caliber have a 70-hour power reserve . This means the watch can run for almost 3 days without needing to be wound. In terms of design, the manufacturer chose to forego the typical Navitimer slide rule bezel used to convert units and to make calculations important to aviation. Instead, the Navitimer 8 has a bidirectional bezel that can be used to measure periods of time thanks to its triangular markers. The so-called "railroad minute track" and Arabic numerals were also inspired by historic onboard clocks. Models with a black DLC coating feel particularly sporty and modern, while the chronograph in red gold is quite elegant. 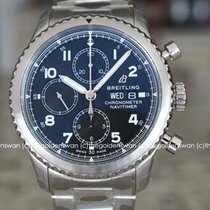 How much does a Breitling Navitimer 8 cost? A stainless steel Navitimer 8 B01 Chronograph 43 with a leather strap and in-house caliber costs at least 6,100 USD in mint condition. The variant with a stainless steel bracelet is a few hundred dollars more. The dial is available in black or blue. Plan to spend around 17,100 USD for the model in red gold with a brown crocodile leather strap . 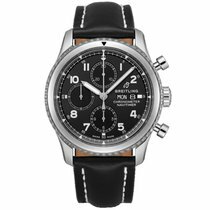 Chronographs without the B01 in-house caliber are markedly less expensive. You can tell these watches by the configuration of their dials at 6, 9, and 12 o'clock, as is typical of the Valjoux 7750, and the day-date display at 3 o'clock. Prices for these models sit around 4,400 USD. 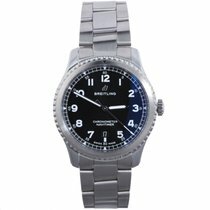 These watches also come with the choice of a black or blue dial and bands made of leather or stainless steel. The Breitling Navitimer 8 B35 Automatic Unitime 43 features a world time function, meaning it can display the time in 24 time zones simultaneously. The dial is available in black or blue, and the bands come in stainless steel or crocodile leather. You can purchase a Navitimer 8 Unitime for about 6,500 USD. The Navitimer 8 Day & Date and the Navitimer 8 Automatic are significantly less expensive. With only three hands and date display at 6 o'clock, the latter looks particularly tidy. At 3,200 USD, it is the collection's entry-level model. The Day & Date is only slightly more expensive at 3,400 USD. In addition to the date display at 6, the day is also written out in a window at 12 o'clock. The Official Swiss Chronometer Testing Institute (COSC) has certified the ETA-based movements used in both these models. 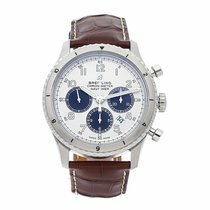 What are the prices for a classic Navitimer? 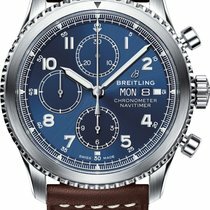 The Navitimer has been Breitling's most famous and successful model for years. No other watch is as closely linked to its brand as this pilot's watch is to Breitling. Its characteristic slide rule bezel used to make mathematical calculations is known to nearly every watch fan. This iconic pilot's watch has come with the Breitling chronograph caliber B01 for several years now. In mint condition, this stainless steel timepiece costs 6,200 USD, while a pre-owned piece goes for around 5,600 USD. If you can do without an in-house caliber, you may enjoy the so-called "Old Navitimer." This wristwatch is powered by the time-tested Valjoux 7750 caliber. Prices for never-worn models sit at almost 4,200 USD. Pre-owned versions cost a few hundred dollars less.